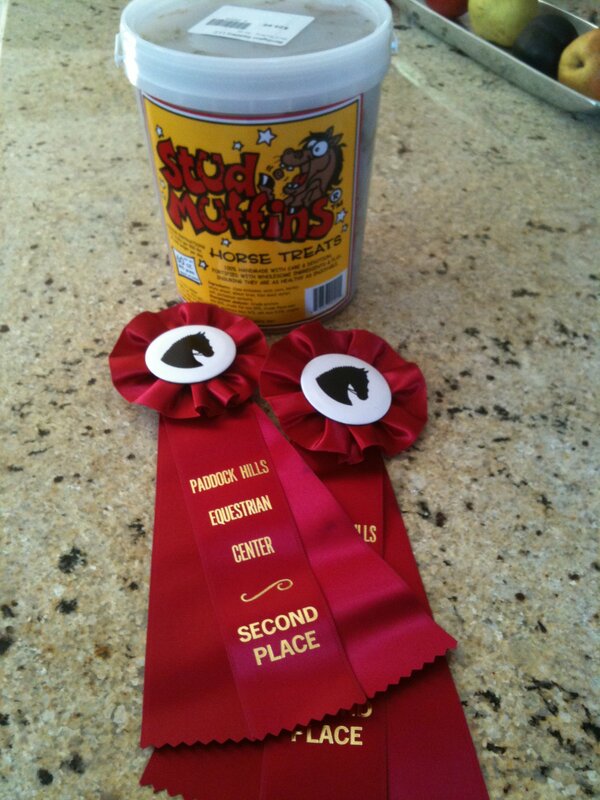 Red ribbons for me, and a giant bucket of cookies for a very deserving Derby. Today was my first outing with Derby, and though we didn’t produce the best test we could, the day was an unqualified success. And I had a lot of fun! I really couldn’t be much happier. The day started in the wee hours, before sunrise. I rolled into the barn and surprised a dozing Derby when I pulled him out of his stall for a mane braiding session. My fellow show-bound riders Liz and Cassie showed up, along with our dressage trainer, Christy, shortly after I started on Derby’s mane. All the horses were clean, polished and booted when the trailer pulled up at 6:30. 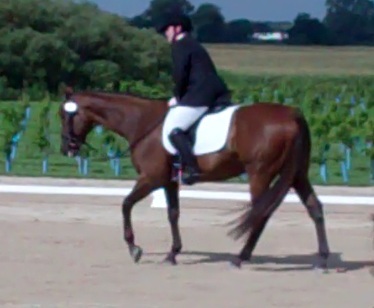 I was totally thrilled with how Derby loaded. After enduring some hair-raising episodes with other horses, I have to tell you, my favorite moment of the day was when Derby stepped up onto the trailer and quietly started nosing his hay while I hooked the trailer ties. 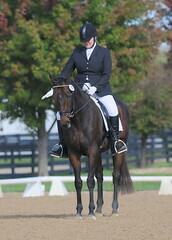 He unloaded easily too, once we arrived, and was unruffled as we walked around the facility hosting the show. I didn’t care what happened at that point. I was really happy with him. What a cool customer. Soon it was time to tack up and get going. The warm up was busy but Derby didn’t look at a thing. We stretched a bit and trotted around, but I wanted to conserve our energy, so I didn’t do much. Heading down the center line for the first time! 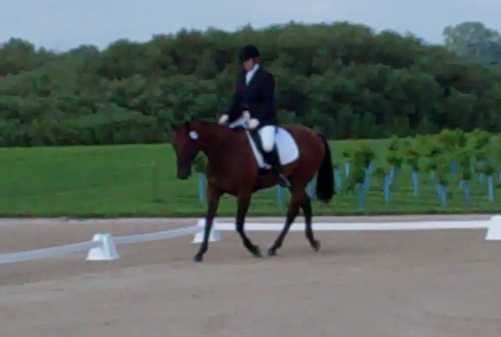 The tests were being ridden on a dressage court just outside the big indoor where we were warming up. We walked out of the indoor and down to the court for our test, where things got momentarily interesting. A horse was unloading in the field adjacent to the dressage court, and a mini-donk on the property started to welcome the new arrival at the top of his lungs. EEEE-AWWWW EEEEEE-AWWW! At that moment, Derby noticed the people under the tent we had walked by and around just an hour ago. He shied and suggested that we turn around. I disagreed, and put him to work with a few circles, bending etc. In just a minute we regained our composure (and our marbles), greeted the judge and scribe, and then we were on our way. Derby was still a bit tense but was otherwise as good as gold. 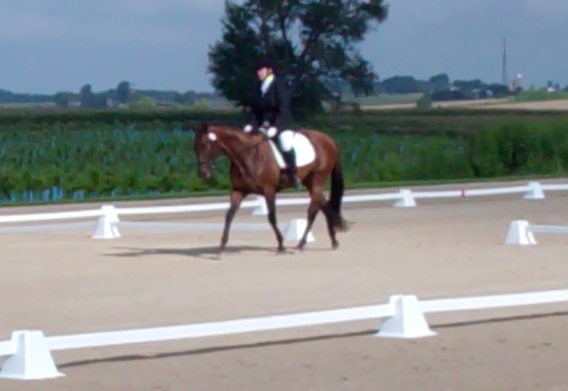 I didn’t push it and rode conservatively, but it was still good enough for a 60.5% and a second place riboon. A nice moment, right in front of the judge. We got a 7 on this circle. Yay! I took Derby back to his stall, untacked him and took out his braids, while simultaneously feeding him cookies, brushing him off, and telling him what an awesome boy he was. I left him to chill with a big serving of soaked beat pulp and alfalfa, and went to watch the others ride and to hang out with our friends Sue and Brittany, who came along to offer moral support. It was such a beautiful day. My grape Gatorade tasted like champagne. All of my friends had nice rides – Cassie and Coda brought home two blue ribbons, and Cloud and Remy were both much cooler on their second outings, and both turned in very good performances. We all went home with ribbons that were either red or blue (except Christy, who rode HC but was thrilled that her green bean was awarded two 8s!) and once again, the horses all loaded and unloaded with minimal-to-no fuss. Once back in the barn, Derby donned his bug gear, and he and Remy headed out to their paddock to roll and doze in the sun. Christy, Brittany, Liz and I went and grabbed lunch, recounting our successes making future plans. I’m just thrilled to bits with Derby and can’t wait for our next adventure. What a fun day! Am very happy with my serving of crow. Well done! Sounds like a most excellent show. Thanks for the kind words, Aimee. It was indeed a most excellent day. Awww! You guys looked great! What a good boy! Pats to you both!